The Hoover UH30010COM gives you a combination of a lightweight Platinum Upright along with a lightweight canister vacuum. Leaving the canister functions off the upright vacuum makes it lightweight (less than 12 lbs.) and maneuverable. The upright uses WindTunnel® Technology to remove embedded dirt and minimize blow-back or scatter on carpet. A high/low speed control is illuminated and located on the handle for easy access. 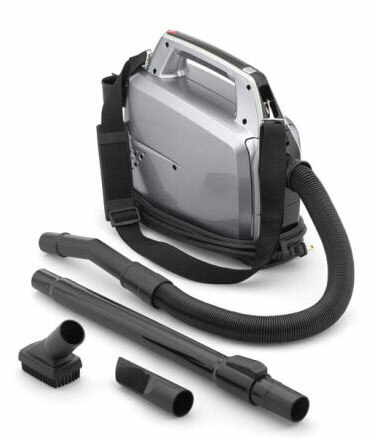 To prevent you from breathing in the dust and dirt you are vacuuming, the vacuum bags have HEPA filtration media, and are self sealing when they are removed from the vacuum. A bag check indicator lets you know when it is full. No Scuff bumpers prevent marking your furniture when you bump into it. Edge Cleaning – channels with bristles lift dirt and direct suction to the edge of the vacuum to clean around furniture, walls and baseboards. The Hoover Platinum upright automatically adjusts to clean all flooring types. Five year, best in its class warranty. The included Portable Canister includes a shoulder strap, stretch hose and on-board tools to provide for your above floor cleaning needs. Tools include a bare-floor brush, dusting/furniture brush, and a crevice tool. The vacuum has a 5 foot stretch hose for extended reach. For convenience, it has a 25 foot power cord. As with the upright, this canister uses Bags with HEPA Media which can trap 99.97% of dust and pollens down to 0.3 microns. An included 12″ Extension Wand extends the length of the hose. Hoover Upright Vacuum Cord Length: 35 feet. Upright Vacuum Weight: less than 12 lbs. Smart-Review Commentary: The Hoover UH30010COM combines a lightweight upright vacuum with a canister. To achieve the lightweight upright, Hoover uses the canister for all the hose and attachment features. Both the upright and canister use HEPA media bags to keep the dirt and dust in the bag and not into the air you breathe. The bags are self sealing to keep dirt from getting in the air when changing bags. Illuminated controls on the handle with 2 speeds. This model includes Hoover’s five-year limited warranty. The no scuff bumpers and edge cleaning make this vacuum ideal for cleaning around furniture and walls. This model has received excellent reviews by consumers. This model is a Smart-Review top pick and a great value for both an upright and canister. 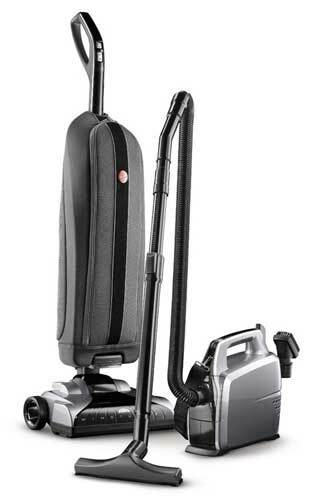 Description: Hoover combines its lightweight UH30010COM “Platinum” upright, with a carry around canister vacuum. WindTunnel® Technology removes embedded dirt and minimizes blow-back and dirt scatter. The upright comes with a long 35 foot power cord. This model is a top pick in the upright vacuum category.